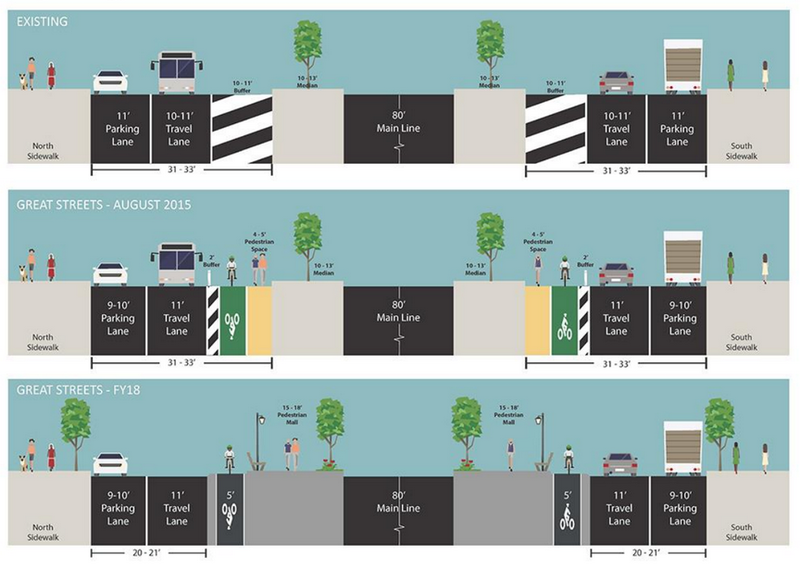 If Queens Boulevard can get a protected bike lane, you can probably put one on almost any street in the country. Yesterday, the Transportation Alternatives Queens Committee hosted the first of what it hopes are many celebratory bike rides down Queens Boulevard, trying out the first 10 blocks of the bike lane installed this month by NYC DOT. When complete, this project will run 1.3 miles from Roosevelt Avenue to 73rd Street. It’s the first phase in what the city has promised will be a thorough overhaul of the “Boulevard of Death,” which is also the most direct east-west route in the borough. Over the years, many lives have been lost on Queens Boulevard. I spoke to riders yesterday about all the hard work that volunteers and advocates put it in to make this bike lane happen. Posted in Bicycles, Pedestrians. Tagged as bike lane, cycle track, Families for Safe Streets, Jessame Hannus, Jimmy Van Bramer, NYC, NYC DOT, Peter Beadle, protected bike lane, Queens, Queens Boulevard, Transportation Alternatives, Vision Zero. That mixing zone with the cab crossing at around 25 seconds still looks like it could be really bad. My observation is that drivers are usually not coming to a full stop in places, treat many of the mixing zones like a slow yield. But as the lane improvements fill in and more ride, I wager even the worst ones will not be so bad. Besides, what was there before was about 10x more dangerous. And remember this is interim. There will be an amazing design in the ground by 2018. I can't help but notice a lot of people riding in the pedestrian space in the video. In only a few short years the capital buildout will segregate that space and narrow the bikeway to its intended width. Why is there no focus or interest in the quality of the design? We win a huge political victory and then drop the ball and fail to capitalize on it with the highest quality infrastructure we can. But then the bikeway will be grade-separated. I don't think this is dropping the ball. The ped-area (which no one will really use, I'd just stay on the sidewalk) just becomes extra space to maneuver or more buffer if you ride in it. The capital buildout as designed now seems to be pretty damn good. I am not sure how much better DOT could have done this seeing how various and complicated each block of Queens Blvd is now. 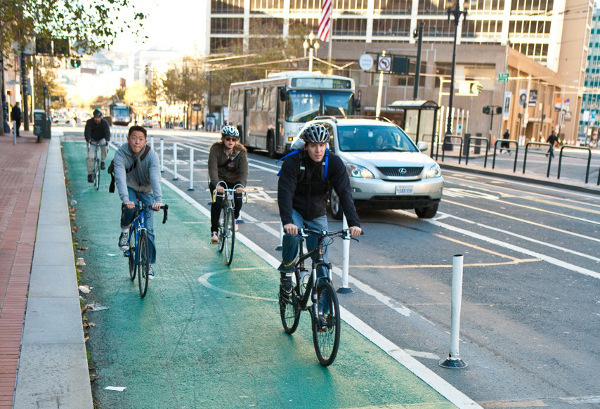 Remember too, the bike lane is not that bustling with riders. This was a celebratory ride. Even ten years from now with a huge bike share increase I'd never foresee that many riders clumped together at once. Kudos to all of the folks who put in so much time and effort to make this happen! Congratulations! To the memory of all those who died on QB including our good friend James L.
I don't know why a ped area was even included. As you said, nobody will use it anyway, so all it does is make the "official" bike lane narrower. Gotta claim that space now. 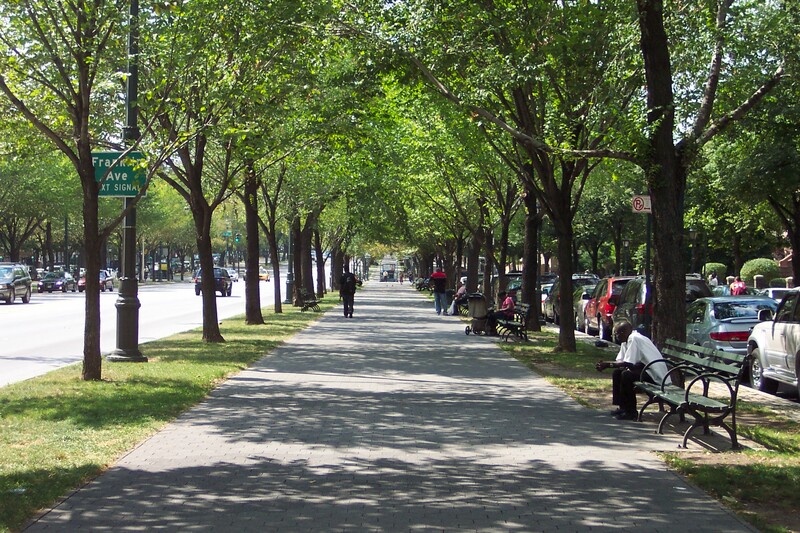 If the grand plan is to have a wonderful boulevard that is somewhat similar to Ocean Parkway or Eastern Parkway then you gotta take it. If they build it as they promise then you will see people using it. All of this is a test run of sorts to see how traffic behaves, the road needs to be as narrow as it will be to speeds and behavior can be accurately studied. So nothing wrong with ped area. This is a specious claim as the elevations already put out of the future capital project show it just as narrow, and what's worse, with sharp edged benches right at the edge of the bikeway ensuring that anyone trying to pass will be doing so with a very unforgiving design. I've personally known of two crashes caused by the unforgiving sharp edged designed of the multimillion dollar Manhattan Bridge bike path, one of them severe. They keep referencing it as a protected bike lane, but I don't see any protection. I think segregated bike lane would be a better term. Add some Jersey barriers then we can call it a protected bike lane. Eastern and ocean parkway malls get used. Isn't the final design giving Queens Blvd a pedestrian mall sort of like those two roads have? Why wouldn't it be used? If it is then it's fine. I still think the bike lane should be wider. Perhaps on the final version the buffer will be included as part of the bike lane, and there will be a more substantial barrier between it and the car lane (hence no need for a buffer zone). I assume the problem is that if you make the bike lane seven feet wide (or however wide it needs to be to handle comfortable passing and whatever number of wrong way cyclists should be expected), and add a three foot buffer beyond that before any benches to make it a forgiving design for cyclists that without those five feet you might not have enough room for the pedestrian mall and buffer. 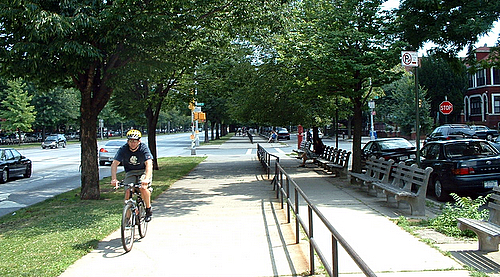 The benches that get used on the two parkways in Brooklyn are pretty far from the main roadways. On Ocean parkway's west mall there is a barrier separating a pedestrian side from the bike side. Whenever I've biked it I've seen people walking on the bike side (especially on Saturdays). I don't know if it's a multi use path and they're allowed to walk there instead of a bike only path where they're not. I've always figured they walk there because the pedestrian side is narrower to the point where if someone is sitting down and talking to a friend that's standing up in front of them it can be annoying to get past. If you moved the planned benches five feet closer to the main roadway to widen the bike lane and put in a forgiving buffer zone for cyclists, and you take eight feet for a buffer between the pedestrian space and the main roadway does that leave enough for the walkway? I'm not sure there is enough space being allocated to the cycle track and mall for the future Queens Blvd to become a great street, though it will be much improved. Thanks for the detailed diagrams and explanations. I tend to agree we're not taking enough space for a cycle track and mall now but I think of this more as a good first step. We can't go from nothing to world class in one shot. Hopefully people will suggest further improvements as we go along and DOT will be open-minded. I also tend to think there's a huge potential for great things in the space under the #7 viaduct, even more so than on this portion of Queens Boulevard. Frankly, I'm surprised this is being built at all. Never thought I would any type of bike infrastructure on Queens Boulevard. Is it that difficult for the city or state to drop down some rubber bumpers or something to keep cars out? Sorry..a few cones don't make a protected bike line.